The global ultra-secure smartphone market was valued at $818 million in 2016, and is projected to reach $4,934 million by 2025, growing at a CAGR of 22.3% from 2018 to 2025. Ultra-secure smartphones are more secure than regular smartphones as they encrypt all communication, and block unauthorized tracking systems. With these features, the privacy issue associated with android smartphones is resolved. Rise in customers’ inclination toward ultra-secure smartphones fuels the adoption of ultra-secure smartphones. Further, increase in security threats and ongoing technological advancements provide the marketers immense scope to target their customers and enhance the user experience. Public’s lifestyle pattern has shifted towards speed and accessibility. Everyone uses mobile applications to satisfy basic needs, such as booking tickets for movies or travel. Mobile applications are most often used as search engines for specific requirements. Increase in usage of mobile applications for routine needs gives rise to privacy-related risks. Ultra-secure smartphones are designed in such a way as to prevent data leakage from smartphones. As the security has become a criterion of utmost importance in a customer’s selection of smartphones, customers’ inclination towards ultra-secure smartphones has supplemented ultra-secure smartphone market growth. Government agencies is expected to grow at a significant pace during the forecast period. The android segment led the market in 2016, and is expected to continue to this trend in the near future. Furthermore, the North American region is expected to dominate overall market during the forecast period, as it adopts ultra-secure smartphones on a larger scale. The global ultra-secure smartphones market is driven by rise in customers’ inclination toward ultra-secure smartphones, its ability to provide better security and reliable transmission of data, and growth in adoption of ultra-secure smartphones for military and commercial applications. However, requirement of cooperating handsets and its high price are expected to impede the market growth. 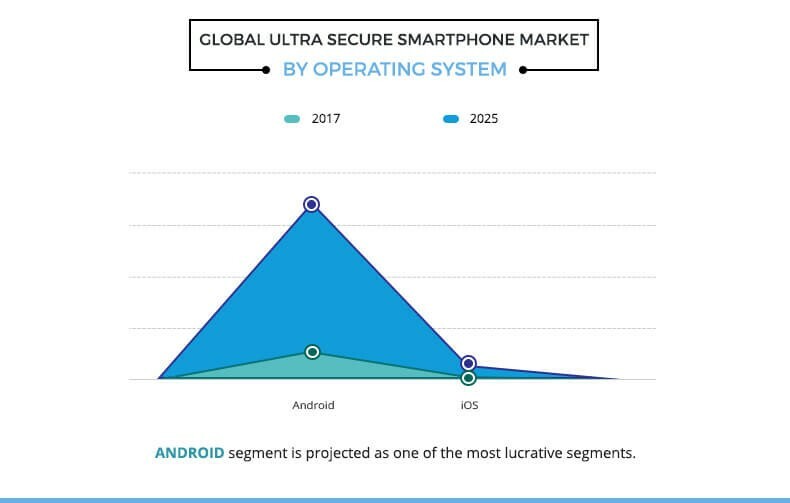 The global ultra-secure smartphone market is segmented based on operating system, end user, and geography. Operating systems covered in this study include android and iOS. On the basis of end users, the market is bifurcated into government agencies, aerospace & defense, and enterprises. Based on region, it is analyzed across North America, Europe, Asia-Pacific, and LAMEA, including country-level analysis for each region. 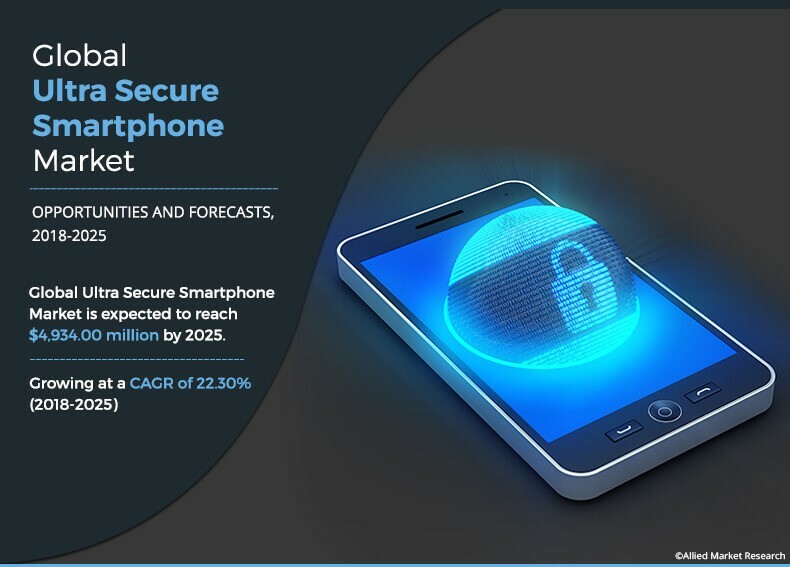 The key players operating in the global ultra-secure smartphone market are ESD Crytophone, BlackBerry Limited, DarkMatter, Inc., Sirin Labs, Turing Robotic Industries, Boeing, Silent Circle, LLC, and Atos SE. The market is expected to be driven by rise in customers’ inclination toward ultra-secure smartphones, ability to provide better security and reliable transmission of data, growth in adoption of ultra-secure smartphones for military and commercial applications, and technological advancements in the market. However, requirement of cooperating handsets and its high price are expected to hamper the market growth during the forecast period. Due to shift in public’s lifestyle pattern towards speed and accessibility, use of mobile applications to satisfy basic needs has increased. Mobile applications are most often used as search engines for specific requirements. Increase in usage of mobile applications for routine needs gives rise to privacy-related risks. Ultra-secure smartphones prevents data leakage from smartphones and provide more privacy and control of the personal information, both online and offline. The apps in the smartphones harvest too much data such as the flashlight app needs access to contacts book. Handsets are just as vulnerable to hackers and malware as PCs, but harder to protect which has increased the need to provide more privacy in smartphones. The ultra-secure smartphone provides greater control over what other people can do on their phone and encrypts data stored in the phone, which provides greater security. Data encryption helps in ensuring that there may not be any data transmission from the smartphone by any other party. In addition, numerous security features provided by key players of the market also fuels the growth of the market. The adoption of ultra-secure smartphones has increased in military and commercial applications to secure the information from terrorists and tyrants. Moreover, companies of this market launch special smartphones for military and commercial applications which also fuels its adoption. Ongoing technological advancements in the market to provide more privacy, better control of the sensitive data and to reduce cost is opportunistic for the market. For instance, in February 2018, Atos introduced the Hoox K31, new smartphone model - part of the Hoox for business range. This phone is ultra-secure telephony solution for professionals. This study includes the analytical depiction of the global ultra-secure smartphone market along with current trends and future estimations to determine the imminent investment pockets. Porter’s Five Forces analysis illustrates the potency of buyers & suppliers operating in the global ultra-secure smartphone industry. The ultra-secure smartphone encrypts the data and blocks unauthorized tracking systems. The encryption of message helps in minimal loss or reduces the transmission of personal information. The ultra-secure smartphone provides greater control over what other people can do on their phone, encrypts data stored in the phone, which provides greater security. Even though the price of these smartphones is quite high, increase in consumer tendency to pay high cost for better security drives the growth of the ultra-secure smartphones market. Moreover, many small and medium size entrants are entering into the market with advanced product portfolio as well as many ongoing technological advancements by key players create numerous opportunities for the ultra-secure smartphone market. Moreover, continuous increase in cyber security threats fuels the ultra-secure smartphone market growth. 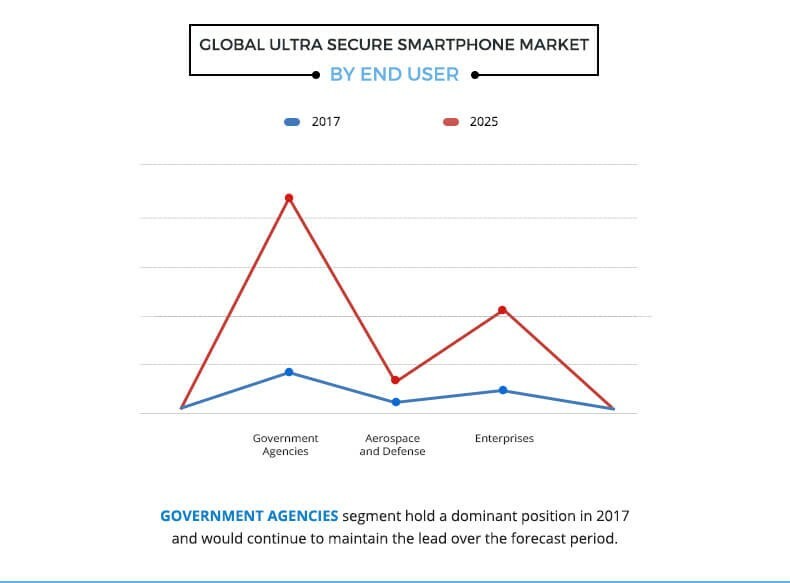 Some of the key players operating in the ultra-secure smartphone market that are profiled in the report include ESD Crytophone, BlackBerry Limited, DarkMatter, Inc., Sirin Labs, Turing Robotic Industries, Boeing, Silent Circle, LLC, and Atos SE. The ongoing technological advancements in ultra-secure smartphones to provide high security is expected to provide sustainable market opportunities as the adoption of these phones has increased in military and commercial applications. Key players adopt various growth strategies to enhance their product portfolio lists to increase their market penetration and invest in priority approaches for research to develop new products to increase their customer base, and capitalize on the growing demand for ultra-secure smartphone.